Shares in property firm Intu have jumped 13% after it said it was mulling a bid from a consortium of investors. 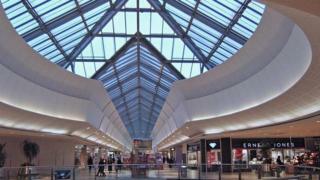 Intu owns a number of big UK shopping centres including Lakeside in Essex, the Metrocentre in Gateshead, and the Trafford Centre in Manchester. The consortium is made up of three companies – the Peel Group, Saudi Arabian firm Olayan and Canada’s Brookfield Property. It had offered 205p a share last week, but has now upped the bid to 215p a share. Peel Group is owned by UK billionaire John Whittaker, who is also Intu’s deputy chairman. Peel Group already owns 27% of Intu, while Olayan owns 2.6%. The consortium has been granted access to Intu company documents in order to conduct due diligence, with a view to making a firm offer. In April, rival shopping centre owner Hammerson, owner of Birmingham’s Bullring, abandoned an attempt to buy Intu, saying it was “no longer in the best interests of shareholders”. Hammerson’s £3.4bn bid was higher than the offer currently on the table. Intu’s share price has fallen since April and its current market value is about £2.1bn.